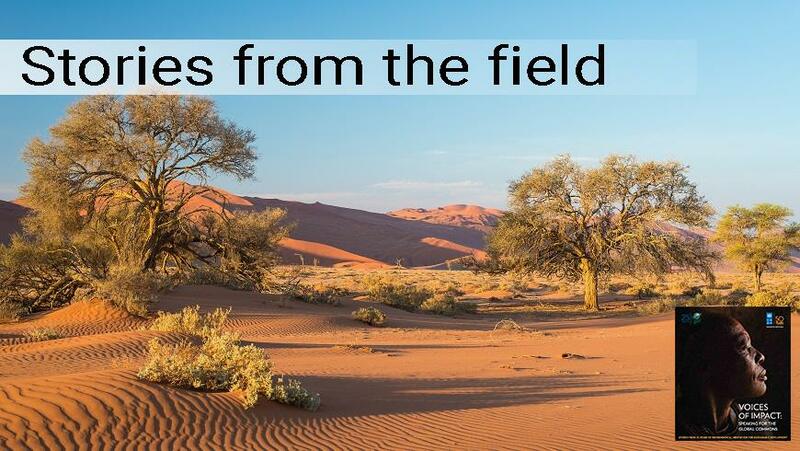 "Nearly 50 percent of our land surface in Namibia falls either within national protected areas or communal or private conservancies"
“Every day, my office phone rings almost non-stop. Calls from farmers, communities, NGOs, schools, journalists, businessmen, park visitors ... and so it goes on. Game parks and wildlife are big in this country. Why? Because they are such a dominant feature of our land – nearly 50 percent of our land surface in Namibia falls either within national protected areas or communal or private conservancies. When you visit my country, you will see wildlife roaming freely almost everywhere. Namibia’s progress with strengthening the national park system has gone hand-in hand with the 15-year history of our partnership with UNDP and GEF. Between 2004 and 2012, our first protected area project, Strengthening the Protected Area Network (fondly known as SPAN), laid many foundations for the country to establish a protected area system which can truly serve as a cornerstone for conserving the country’s amazing biodiversity – and also serve as the engine for our rural development. During those exciting eight years, we proclaimed five new protected areas to include previously under-represented ecosystems such as Succulent Karoo and Acacia Tree and Shrub Savanna. Overall, our protected area coverage now stands at over 17 percent of our total land area – this amounts to an area more than three times the size of Great Britain. Through the SPAN project, we developed a number of important national policies. For example, the HumanWildlife Conflict Management Policy and the Parks and Neighbours Policy, which provide clear guidance on how we deal with human-wildlife issues. Probably the most important policy was the Tourism and Wildlife Concessions Policy, which was followed by the establishment of a dedicated implementation unit within the Ministry of Environment and Tourism. protected areas, whether these are for a camp site or a lodge, and which may be a joint venture with the private sector. It is our strategy to ensure that protected areas deliver direct benefits to communities living within and around them, and in return communities become custodians of our protected landscapes. A very welcome bonus of this concession system is that it provides extra revenue which is reinvested in maintaining the protected area network. The economic analyses we conducted as part of SPAN in 2004, showed that the protected area system already contributes up to 6 percent of the country’s GDP in direct revenues from park-based tourism, with 24 percent economic return on government investment. These results enabled a decision to earmark 25 percent of park entrance revenues for reinvestment in the protected area system through a trust fund, providing up to US$ 2 million additional financing per year. The second economic study, published in 2010, indicated that if we realize the potential for community benefits through the tourism and wildlife concession system, economic return on government investment in protected areas could be as high as 42 percent over 20 years. After our project’s number-crunching, I can proudly and confidently tell our Ministry of Finance that nurturing our natural assets is going to yield win-win returns for both the people and wildlife of Namibia. Our second project, called the Protected Landscapes Conservation Areas Initiative – or NAMPLACE for short, started in 2011. Given that the majority of wildlife in Namibia occurs outside national protected areas, the idea has been to establish Landscape Conservation Areas which bring together different conservation-oriented land-use units, including protected areas and privatelyowned farms and conservancies. This takes our protected area management approach further, working at truly landscape levels for further improving the effectiveness of our conservation actions. We have already managed to establish five Landscape Conservation Areas covering some three-and-a-half million hectares. How did these successive projects change my life? A lot! Because of the outputs generated through the projects, I now have firm policy backing for dealing with parks and wildlife issues. Our budget for protected area management has increased four-fold and we have a stronger legal and institutional structure for protected area and wildlife management. Government as a whole, and people in towns and villages, are increasingly recognizing the value of protected areas and wildlife in the country – not only as an important cultural and natural resource and part of our heritage, but also as major assets for our sustainable development. And, of course, I now have more parks to look after, but I am much better equipped to do so. However, this job is never free from new challenges. We currently face an upsurge in rhino poaching, fueled by demands for rhino horn in Asia. Thankfully, with support from our third protected area project – Strengthening the Capacity of the Protected Area System to Address New Management Challenges – we are working to improve the monitoring and enforcement system to deal more effectively with wildlife crime. COLGAR SIKOPO has spent his entire life associated with wildlife and game parks. Born and raised in a small village in north-east Namibia, he grew up with elephant, hippo and lechwe in his backyard. After school, he studied nature conservation at Namibia’s University of Science and Technology, and then joined the Ministry of Environment and Tourism (MET) in 1997 as a park ranger. After 15 years of working with wildlife, he was appointed to the position of Director, Wildlife and National Parks, in the Ministry of Environment and Tourism, with responsibility for all protected areas and wildlife in Namibia. approaches to establishing and managing protected areas are insufficient to prevent biodiversity loss, land degradation, and consequent economic decline, and this is why Namibia is working to take conservation beyond its traditional boundaries. With the support of the UNDP and GEF, Namibian Government agencies are working to lift conservation barriers and advocate for the establishment of a large-scale network of protected landscapes where landowners and the conservation authorities come together to manage ecosystems at the landscape scale. As described by Colgar Sikopo, a series of three projects between 2004 and the present, amounting to a GEF investment of US$ 17 million, have built on each other to unlock the potential of Namibia’s protected areas – including community-conserved areas – while contributing to human development in the country.